Maria Beierlein nee Saule, is my grand step-aunt . . . step-sister to my Oma, Liselotte Haf nee Kaiser-Saule (1913~2010). 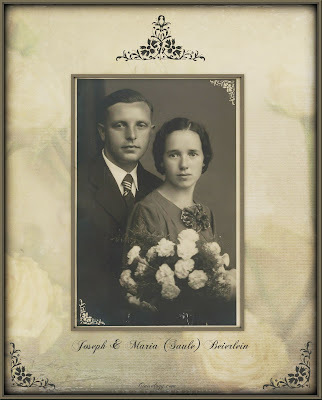 I found this wonderful wedding photo among the photos that my mom, Elfreide Haf-Serafin (1933~2010), brought back from Germany in April of 2010. I noticed aunt Maria's flower bouquet is very similar to my mom's bridal bouquet in this → photo - both so beautiful. I remember very little of aunt Maria and I spent some time today attempting to find records on her but was unsuccessful . . . time to call my auntie Gitta in Augsburg.